The Museum of Fine Arts in Houston has paid $1.25 million for a still life painting that for years covered a hole in the wall in an Indiana home, its value unknown to the owner and its existence unknown to art experts. The painting, "Magnolias on Gold Velvet Cloth" by the 19th-century American painter Martin Johnson Heade, was sold by a man in his 30's who works at a tool-and-die company. He started to realize the value of the work in January when he played Masterpiece, a board game about art that includes an image of a similar Heade. Intrigued, he turned to the Internet, found that Kennedy Galleries in Manhattan handled Heade's work and sent an E-mail asking if his painting might be by that artist. He then sent digital images of it to Kennedy, which had the painting authenticated and made the match with the Houston museum. "This is an important rediscovery, and the painting is a magnificent example of Heade's work at its best," said Theodore E. Stebbins Jr., author of the 1975 catalogue raisonne of Heade's works. For the newly updated edition Mr. Stebbins, the American paintings curator at the Museum of Fine Arts in Boston, quickly added the Houston Heade. "Magnolias on Gold Velvet Cloth," painted around 1890, is the third important Heade flower painting to turn up in recent years. Last month at Christie's "Two Magnolias on Blue Plush" sold for $882,500; the seller, a man from Wisconsin, had paid $29 for it at a rummage sale a decade ago. And in 1996 Christie's sold "Magnolia Blossoms on Blue Velvet" for $937,500; it had been bought along with a smaller Heade of cherokee roses at an estate sale in Arizona for $100. Heade, a meticulous painter born in 1819 in Pennsylvania, is known for his luminous landscapes and nature works as well as his floral still lifes, which he painted largely after settling in St. Augustine, Fla., in 1883. It makes sense that these works are now being rediscovered, said Paul R. Provost, the American paintings expert at Christie's, because many people purchased them while on vacation in Florida, then took them to their homes around the country. "They were passed down in the family, whose members didn't always know what they had," he said. The seller of "Magnolias on Gold Velvet Cloth," who wants to remain anonymous, bought it along with some furniture years ago for "next to nothing," said Martha J. Fleischman, the president of Kennedy Galleries. "He was ignorant of the value, but he loved it." Heade's magnolia still lifes, which capture the blossoms at close range and in various stages, number fewer than 20 and are indeed popular. "They are evocative, elegaic paintings, with soft, tender light, unique in American still life painting," Mr. Provost said. The Boston museum, the National Gallery of Art in Washington and the Art Institute of Chicago are among the museums that own examples. "What sets this apart from his other magnolia paintings," Ms. Fleischman said, "is that there's a little bit of leaf mold on one of the leaves, like a beauty mark." As soon as Ms. Fleischman saw "Magnolias on Gold Velvet Cloth" coming up on her computer screen, "I got very excited," she said. "I knew it was real, and I felt it was a museum-quality picture." So did the people at the Houston museum, once they learned of the discovery in March. In her excitement Ms. Fleischman had confided to a decorative-arts curator there that she "had made the find of my life," but could not yet disclose what it was. Emily Ballew Neff, the museum's curator of American art, was soon on the phone to her, asking to know of the discovery as soon as Ms. Fleischman could tell. "I called her every week or every other week to let her know we'd be interested," Ms. Neff said. "The second she told me what it was, I knew we had to have it." The painting was sent to Houston for inspection in late March. It was, as Ms. Fleischman had already discovered, still in its original frame and in near-perfect condition, protected from wear by the original glass. "I was 99 percent certain that this painting would never leave Houston," Ms. Neff said. Peter C. Marzio, the museum's director, called an emergency meeting of its trustees, who approved the purchase in less than an hour and a half. One trustee, who chose to remain anonymous, provided most of the cash, and two foundations provided the rest. 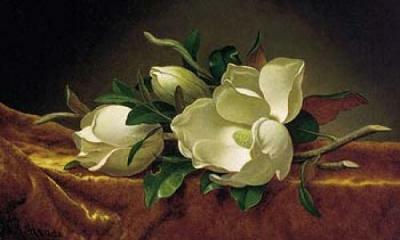 "Magnolias on Gold Velvet Cloth," the museum's first work by Heade, went on view in Houston on Wednesday.